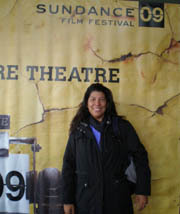 The Dominican Republic Global Film Festival (DRGFF), an initiative of Global Foundation for Democracy and Development (GFDD) and Fundación Global Democracia y Desarrollo (FUNGLODE), attended the 2009 edition of the Sundance Film Festival, which took place January 15 – 25 in Park City, Utah. This year the world’s most prominent independent film festival celebrated 25 years of presenting new voices and means of transmitting stories through film. DRGFF was there to participate in the celebration, which commenced its 2009 journey to attend the most distinguished film festivals worldwide in order to identify the international cinematographic works that will be premiered in the Dominican Republic during the third edition of the Festival. The Festival team, represented by DRGFF Promotion and Marketing Director Asunción Sanz and DRGFF Local Production Director Yamile Eusebio, participated in the event in an effort to increase awareness of the Festival’s vision and mission, as a means of supporting the advancement of the cinematographic industry in the Dominican Republic, and thus the development of the country. 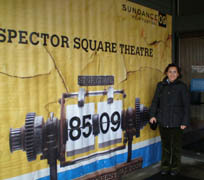 Participation in Sundance also provided the Festival team with the opportunity to become familiar with the latest industry trends, first hand, from some of the world’s most innovative artists and vanguard projects – trends that will impact the growth and quality of GFDD and FUNGLODE projects in the area of audiovisual arts, amongst them initiatives realized by the Global Media Arts Institute. During its 25 years, Sundance has identified new voices, innovative styles and provocative perspectives that have forged new channels of cinematographic creation and artistic expression worldwide. More than 200 films were presented over the course of 10 days, some of which DRGFF hopes to share with the Dominican public during the third edition of its Festival, which will be celebrated November 18-22, 2009. In addition to the film categories featured every year --US Documentary Competition; US Dramatic Competition; World Cinema Documentary Competition; World Cinema Dramatic Competition; Premiers; Spectrum; New Frontier; Park City at Midnight; From the Collection; Animation Spotlight; and Shorts -- this year in celebration of its 25th anniversary, Sundance presented Storytime Project, which included some of the most memorable Festival moments told by the directors, actors and leaders of the project. “During our time at Sundance we were able to meet and connect with many of our partners and invited guests from past Festivals and had the opportunity to converse with them about new projects and ideas related to this year’s Festival,” commented Sanz.